I first read this book last year with full intentions of making a review after. Honestly, the first few lines I typed were sitting in my drafts folder for a long time now. I can’t seem to pull it altogether because I’m afraid what I’ll say is not good enough. I love this book so much that telling the world how I felt while reading it is like exposing my very heart to them. Yes, this book is that good. So, in order to actually write the review, I reread the book and this, what I’m currently typing, is my second attempt to tell why this book made so much impact on how I view life. When I saw this book sitting in the shelf of my fave bookstore, I immediately read the synopsis written on the back cover. It’s honestly a type of book wherein you already know what happens to the characters in the end of the story and yet, you still want to fill yourself in about what happens in between. John Green was able to put humor in between the sad moments of the character’s lives, which in a way is good. It reminds people that no matter how difficult the situation is, we can find ways to go around it, accept that it’s already there and that we can make it through (or probably not). 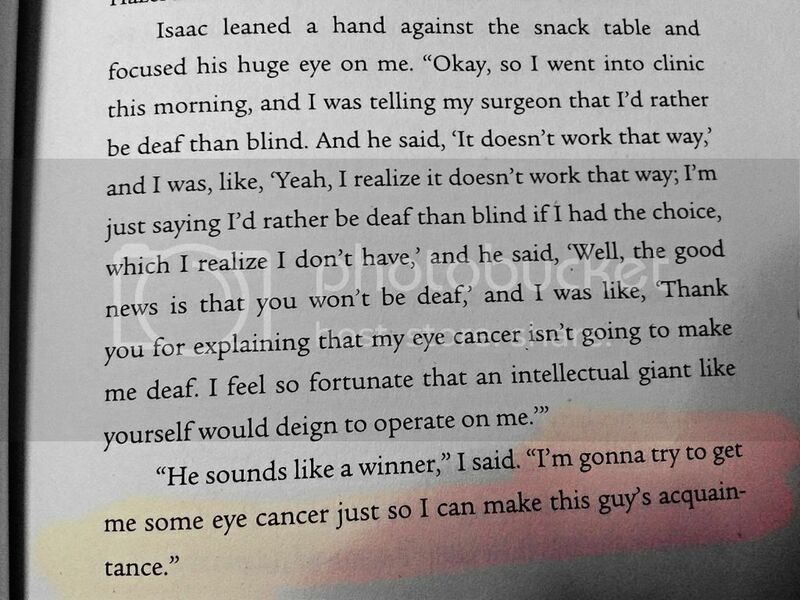 Hazel Grace, Augustus and Isaac are three teenagers who made it seem that despite having cancer, life is beautiful and they chose to live what’s left of their earthly lives the best way they know how. It is utterly acceptable for some people to feel angry or sad at these lines, especially those who experienced to have a loved one with cancer. At first I kinda felt uncomfortable too, because if it happens in real life and I hear kids having that conversation, as if cancer is just nothing, I don’t know how I’d react. I shed a tear a few times especially during the last few chapters of the book. 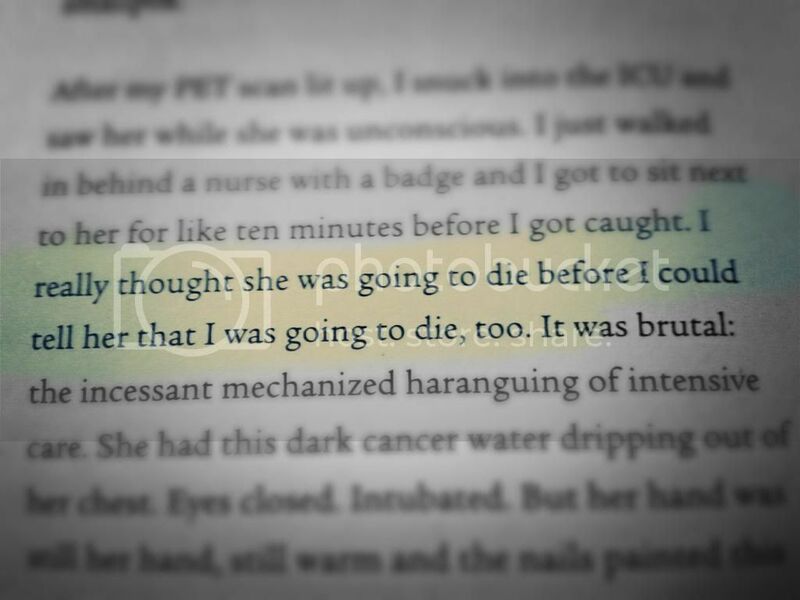 I read some chapters while at work and I think my "officemates" would've thought I was going insane if they saw me blinking away tears. Errrr. The book might sound brutal or morbid but it’s not. It is tragic, yes, but it is also achingly beautiful as it tells a story of hope, loss, love and life all mixed together. I will not give spoilers here. I will just encourage you guys to read the book so you will understand what I am saying! It is worth your time. PROMISE. 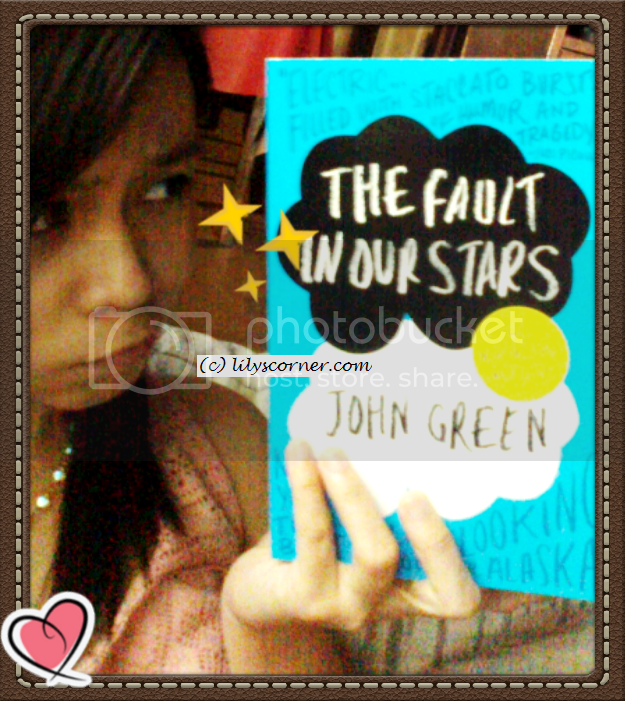 The Fault in Our Stars is, so far, my favorite John Green book. It teaches the readers to be brave inspite of life's mishaps. It would make you feel that you are worth-loving no matter how you look like or who you are. It would encourage you that you can make things possible if only you'll be determined enough to do it. It would remind you that life is short and that you have to live every single day to the fullest. “You don't get to choose if you get hurt in this world...but you do have some say in who hurts you." So, is the fault really in our stars? The fault is in ourselves. There's only a few books (I would say 4) that I had read from cover to cover and this seems interesting considering that I am in the medical world. It's nice that they were able to inject a bit of humour and some memorable quotes in the story as it's always more interesting that way.